Pitney Bowes opens a Global Technology Center in Danbury, CT. The facility will support the Company's continued evolution into customer communications management. Pitney Bowes Inc. (NYSE:PBI) today held a ribbon-cutting ceremony to commemorate the opening of its Global Technology Center in Danbury, Connecticut. The newly-renovated facility will support the Company’s continued evolution into customer communications management (CCM) to help businesses grow by building customer loyalty and increasing profitability through highly-personalized communications. Connecticut Governor Dannel P. Malloy, Danbury Mayor Mark D. Boughton, and other federal, state and local officials, joined Pitney Bowes Chairman, President and CEO Murray Martin at the ribbon-cutting event. The Global Technology Center brings together Pitney Bowes engineering, research and development, product management, and information technology services in Connecticut under one roof for the Company’s communications solutions businesses. This will allow for greater collaboration to build innovative hardware and software solutions, and help engineers identify ways to integrate technologies, products and services for businesses of all sizes. Located at 37 Executive Drive, Danbury, the Global Technology Center includes approximately 300,000 square feet of space with a new open lab environment and office space, collaborative team and project space, upgraded wireless capabilities, and technology-enabled conference rooms and public areas. The Pitney Bowes Global Technology Center employs approximately 650 people. As a global enterprise, Pitney Bowes is integral to the business processes of nearly two million organizations worldwide. Representative clients include more than 90 percent of the Fortune 500 firms; local, regional and national governments in scores of countries; global giants in the health care, insurance, financial services, and telecommunications industries; and hundreds of thousands of smaller firms. Providing innovative solutions that help organizations improve operational efficiency and enhance the value they bring to their clients' communications is key to the firm’s success. Pitney Bowes continues to invest in R&D and strategic partnerships to bring advanced technology to the market. In 2010, the Company’s R&D investment was USD$156 million. In the past year, Pitney Bowes launched a series of new products and services that help organizations enhance communications and make them more personal. These include: the cloud-based pbSmart™ suite of marketing communication solutions; and the EngageOne Liaison™ solution for customer analytics, billing intelligence and electronic bill presentment and payment. In addition, Pitney Bowes announced the Volly™ secure digital delivery service and expanded its family of IntelliJet™ high-speed digital color printing systems. In 2010, Pitney Bowes also acquired Portrait Software, a leading global provider of advanced marketing and customer analytics software, and launched the Connect+™ Customer Communications Series. HARTFORD, CT – Genomas®, a biomedical company enabling DNA-guided medicine for personalized healthcare, announced the award of a 2-year Phase II Renewal Small Business Innovation Research (SBIR) Grant totaling $1.3 million. The grant, entitled “System for DNA-Guided Optimization and Personalization of Statin Therapy”, was awarded by the National Institute of General Medical Sciences (NIGMS)*. Statins are the most prescribed drugs in the world. Statins are the most effective medications for managing elevated concentrations of low-density lipoprotein cholesterol (LDLc). These drugs offer effective strategies to reduce cardiovascular disease and have been documented to reduce morbidity in both coronary heart disease patients and in previously healthy subjects. There are more than 40 million Americans with high cholesterol of which 20 million are currently prescribed the statin class of cholesterol lowering drugs. Statin Induction + Neuro-Myopathy (SINM), the balance of potency and safety, is the main clinical management challenge of these drugs, particularly when treatment targets are aggressive requiring LDL cholesterol levels below 100 mg/dl. In medical practice, Neuro-Myopathy presents as a constellation of neuromuscular side effects. Clinical symptoms include myalgia (muscle aches, cramps, weakness) and myopathy (muscular injury monitored by serum elevation of muscle enzymes). Neuro-myopathy is more frequent at the higher doses required for treating advanced cardiovascular disease and diabetes and varies in extent between individual statins and from patient to patient. Prescribing the most potent statin on an individual basis is critical as well to avoid maximal doses. Statin usage is ultimately limited by toxicity. Neuro-myopathy is disabling to 10-20% of patients on statins, requires alteration of therapy, burdens healthcare with management costs, and reduces compliance. Only 50% of patients remain on statins 6 months after initiation of therapy. The SINM PhyzioType® System consists of 4 tests predicting LDL lowering and HDL raising efficacy, myalgia, and CK activity elevation (mopathy) in response to statins on a class-wide and drug-specific basis. The goal is to enable clinicians to deploy a genetic decision support system to manage statins, prescribe these drugs on a DNA-guided, personalized basis and effectively lower the risk of cardiovascular disease for each patient. The information can be employed prognostically before prescribing statin therapy or diagnostically to categorize SINM in those statin patients already evidencing lack of potency or neuromuscular symptoms and seeking remedial treatment. The research leading to this award has been published in the renowned journals Pharmacogenomics and Muscle & Nerve. Researchers at the Division of Cardiology of Hartford Hospital and at the Cardiovascular Research Institute at the University of California San Francisco, were co-authors of the publications and are co-investigators in the grant, which also includes the Rogosin Institute, an affiliate of New York Presbyterian Hospital and Weill Cornell Medical College. To date, Genomas has secured $6.1 Million of NIH SBIR funding for PhyzioType® product development. These programs have been anchored by the novel partnership the company established in 2004 with Hartford Hospital for translating DNA-guided medicine into clinical practice. Genomas is a biomedical company advancing DNA-Guided Medicine and personalized healthcare. The company develops revolutionary PhyzioType® Systems for DNA-guided management and prescription of drugs used to treat mental illness and diabetes. PhyzioType® Systems are designed to provide physicians with an unprecedented capability to select for each patient the safest and most effective drug to achieve treatment goals and enhance patient compliance. PhyzioType® Systems are composed of an ensemble of inherited DNA polymorphisms genotyped by arrays and interpreted by a bioclinical algorithm in order to convey to physicians predicted comparisons of side effect risk and efficacy among drugs for the individual patient. The company’s clinical pharmacogenetic tests and consultation service are provided through its Laboratory of Personalized Health (LPH), an accredited and licensed high-complexity molecular diagnostic center and its Personalized Health Portal (PHP), a medical informatics interface for clinician decision support. Genomas is located on the campus of Hartford Hospital. Please visit www.genomas.com for more information. *The project described was supported by Grant Number R44 GM085201. The content is solely the responsibility of the authors and does not necessarily represent the official views of the National Institute of General Medical Sciences or the National Institutes of Health. 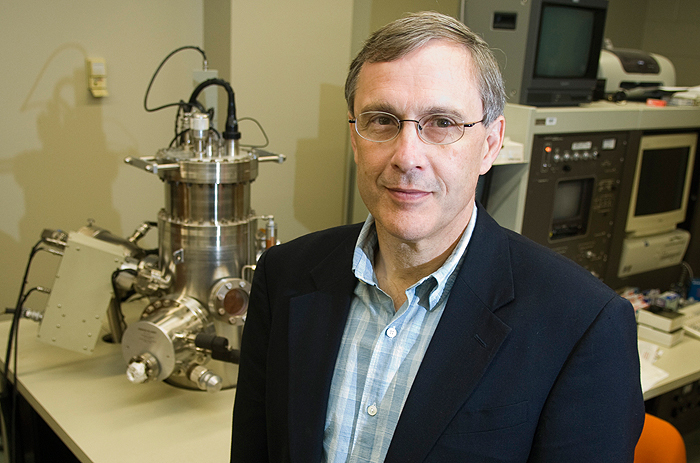 Dr. Steven L. Suib of the University of Connecticut has been named the recipient of the 2011 Connecticut Medal of Science for his outstanding work in the fields of catalysis and materials science over the past 30 years. Suib is a Board of Trustees Distinguished Professor and head of UConn’s Chemistry Department. His work involves the synthesis of novel porous semiconductors used to make new chemicals for use in lithium batteries, oil spills and other applications. Frank W. Ridley, chairman of the Board of Governors for Higher Education, will present the award at the annual meeting of the Connecticut Academy of Science and Engineering on May 25, 2011 at the Stepping Stones Museum for Children in Norwalk, CT. The central question Dr. Suib asks is, “Can we make materials that no one else has made using relatively simple materials?” In his quest, Suib and his team are investigating the creation of synthetic fuels using carbon dioxide — a greenhouse gas — and water, research that could contribute to both reduced greenhouse gases and the development of alternative energy sources. His research team is working closely with Connecticut company, VeruTEK Technologies, Inc., to clean up contaminated industrial and commercial properties and landfills using microemulsion catalysis that converts hazardous and toxic compounds into harmless materials. His other current research involves synthesizing high temperature ceramic fiber composites used for aircraft engine parts. Over the years, Suib has collaborated with industrial researchers in Connecticut such as United Technologies Research Center, Pratt and Whitney, Hamilton Standard, Olin, Yardney Technical Products, Pfizer, ATM, APSI, Rogers Corporation, Uniroyal, Crompton and others. He is also the Head of the Pratt Center of Excellence in Ceramic Chemistry. Dr. Suib has supervised more than 100 Ph.D. students, and among these, nearly 50 serve in research positions in Connecticut industries. A graduate of the State University of New York at Fredonia, Suib earned a PhD in chemistry at the University of Illinois at Champaign Urbana and completed coursework equivalent to a master’s degree in geology. He holds 19 U.S. patents and his work has been honored with national awards from the American Chemical Society and the American Institute of Chemists. The Connecticut Medal of Science is the state’s highest honor for scientists and engineers and recognizes extraordinary achievements in scientific fields crucial to Connecticut’s economic competitiveness and social well-being. Modeled after the National Medal of Science, this award is bestowed by the Board of Governors for Higher Education, with the assistance of the Connecticut Academy of Science and Engineering, in alternate years with the Connecticut Medal of Technology. Suib is the sixth recipient of the Connecticut Medal of Science. Electro Energy Inc. of Danbury has been awarded an $850,000 Army contract to develop advanced rechargeable batteries for the battlefield that could result in orders for hundreds of thousands of batteries for the military in the next few years. Microsoft Corp., has announced that Forza Technology Solutions has attained Gold Certified status in the Microsoft Partner Program with a competency in Network Infrastructure Solutions recognizing Forza’s expertise and total impact in the technology marketplace. Choice One Communications, CTC Communications and Conversent Communications jointly announced today the completion of their previously announced combination. The merged organization will be called “One Communications” as of July 24th and will serve businesses in sixteen states within the Northeast, Mid-Atlantic and upper Midwest regions. With revenues of over $800 million, One Communications is the largest privately-held competitive local exchange carrier in the United States. Governor M. Jodi Rell has announced that the state is providing a $275,000 grant to Connecticut United for Research Excellence (CURE) to support the ongoing operations of its "BioBus." The BioBus is a mobile laboratory that educates middle and high school children about biotechnology through hands-on experiments and a specialized curriculum. Earlier this month CURE released its annual economic report. For an update on spending, hiring in the state’s bio-pharma sector visit the CURE website at www.curenet.org. SpectoWise has announced that it has completed the creation of its next generation legal and claims data aggregation and business analytics reporting platform. The new platform is based on next-generation Microsoft database, data mining, and business analytics technologies. The platform provides for the power, flexibility and performance of data warehousing, data mining and advanced business analytics reporting to the legal and claims industries at a reasonable price. Our friends at Bentley Systems in Watertown are hosting 65 young people from a Western Connecticut State University program for high school students on July 21. The purpose is to get them interested in careers in technology. If you are interested in pulling-off a similar event you can likely contact Bentley’s Charley Ferrucci there.